The best greyhounds in the State gathered last night at Angle Park with the sprinters chasing the $10,000 first prize for the Bargain Steel Centre Anniversary Cup Final and the stayers doing the same for the Distance Championship Final. In one of the most open SA Distance Championship finals in recent years the Nicole Stanley trained Dyna Quota proved too good in the run home for her Victorian counterpart Billy’s Bake for trainer Gerry O’Keeffe in what developed into an exciting finish. In the charge to the first turn Dyna Quota began well from the inside and was quickly challenged by Stitch Em’ Rosey for Shelley Trengove and Rajasthan for Robert Camilleri however they all came together leaving the back straight with Stitch ‘Em Rosey and Rajasthan being checked out of business along with More Rum Batemen for Kevin Murnane who copped the back wash. Dyna Quota balanced up again and moved forward however Billy’s Bake was able to take a run to her inside and assume the lead into the front straight on the first occasion. Out of the front straight and into the back and Billy’s Bake was doing it well with Dyna Quota in second giving chase with Nations moving strongly into third. On the apex of the bend prior to turning for home Dyna Quota moved up stylishly to run to the front from Billy’s Bake who was battling on strongly with Nations still in third. As the field of stayers came down to the finish line Dyna Quota was doing just a little bit the better of Billy’s Bake and went onto win by ¾ length in a solid 43.60 with Nations getting home well into third ¾ lengths away. Dyna Quota returned $7 with online bookmaker Sportsbet. The daughter of Dyna Double One and Jayney Bale is owned by Glen Burns and has been racing in fantastic fashion for the Nicole Stanley kennel. She has now won 7 races from 29 starts with 10 placing’s and prizemoney around $23,000. 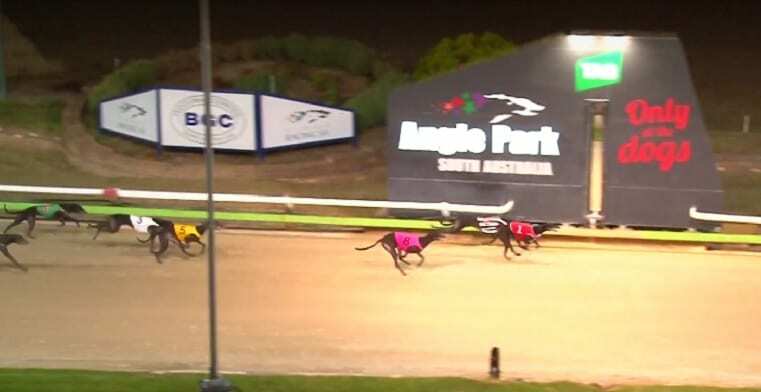 In the Bargain Steel Centre SA Anniversary Cup Final the race was dominated by the Rasmussen kennel that had 5 of the 8 finalists and in an excellent training performance they trained the first three placegetters in the prestigious event. The race was won by Cawbourne Swade trained by Lisa Rasmussen who made it 4 wins in a row with a dominate display of power and speed. The son of Dyna Double One and Cawbourne Abbi began nicely to sit just of the speed as Shimando for husband Tony and kennel mate Diamond Heart ran to the front. They would end up filling the placings however Cawbourne Swade got motoring down the back straight and quickly went past Diamond Heart and then railed past Shimando who was running a bold race in the lead. Turning for home he was in full flight going down to the line to win by almost 5 lengths in a slick 29.50. Shimando ran well again for second while Diamond Heart held on well for third. No doubt there were some hard luck stories back in the pack however Cawbourne Swade made his own luck and was a deserved winner. With both Tony and Lisa taking a well-deserved holiday interstate the race night duties were left to their band of helpers led by their daughter Tara who was gracious on the presentation dais in accepting the Anniversary Cup sponsored by Bargain Steel Centre. Cawbourne Swade has now won 16 races from 41 starts and 12 placing’s with prizemoney over $57,000.